Displaying a gold standard for consistency and durability at his position, Ozzie Smith holds the National League record for most games played at shortstop. Smith achieved the record by overcoming a serious shoulder injury in 1985 that restricted his throwing. Smith chose to let the injury heal naturally rather than undergo surgery. Remarkably, he led National League shortstops in games played in 1985, with 158. “I had a torn rotator cuff (in 1985),” Smith told Hummel in May 1993. “People don’t talk about that much. I’m proud of (overcoming) that. I thought Mother Nature was the best way to handle it. Smith also topped National League shortstops in games played in 1980 (158), strike-shortened 1981 (110), 1987 (158) and 1989 (153). Smith played in the major leagues from 1978-96 for two National League clubs: Padres (four years) and Cardinals (15 years). He finished his career with 2,511 games played at shortstop, ranking him fourth in big-league history. The three ahead of him played either exclusively or primarily in the American League. _ 1. Omar Vizquel, 2,709 games. Vizquel performed in the major leagues from 1989-2012. Four of those years were spent in the National League (with the Giants). _ 2. Derek Jeter, 2,674. Of the shortstops in the top 10, Jeter is the only one who played even one game for the Yankees. _ 3. Luis Aparicio, 2,581. In 18 seasons in the big leagues, all in the American League (with the White Sox, Orioles and Red Sox), Aparicio never played a position other than shortstop. _ 4. 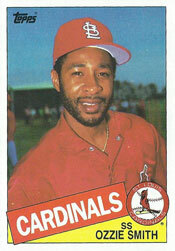 Ozzie Smith, 2,511. Like Aparicio, Smith never played a position other than shortstop in the major leagues. He won a Gold Glove Award in 13 consecutive years (1980-92) and led National League shortstops in fielding percentage eight times. _ 5. Cal Ripken, 2,302. He spent his entire big-league career with the Orioles (1981-2001). Ripken led American League shortstops in fielding percentage four times. After shifting to third base, he led the league in fielding percentage at the hot corner in 1998. _ 6. Jimmy Rollins, 2,227. After 15 seasons with the Phillies, for whom he won four Gold Glove awards, Rollins finished with a year each for Dodgers and White Sox. _ 7. Larry Bowa, 2,222. Bowa played his whole career in the National League, with the Phillies, Cubs and Mets (1970-85). _ 8. Luke Appling, 2,218. He spent his entire big-league career (1930-50) with the White Sox. When he retired, Appling held the major-league record for most games played at shortstop. Six years later, Aparicio became the White Sox starter. It was Aparicio who supplanted Appling atop the career games played list at shortstop. _ 9. Dave Concepcion, 2,178. Concepcion played his entire career with the Reds (1970-88). _ 10. Rabbit Maranville, 2,153. A National League shortstop from 1912-35, Maranville was the starter for the 1928 Cardinals pennant winners. He also played for the Braves, Pirates, Dodgers and Cubs.